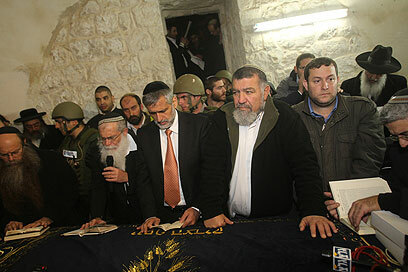 Some 1,500 worshippers led by Interior Minister Eli Yishai arrived at Joseph's Tomb in Nablus on Wednesday night. The visit was coordinated with the IDF and the police. "It's a huge privilege to be here," Yishai said. "Joseph's Tomb belongs to us. Of course we should resume full presence in Joseph's Tomb. The current situation is a blunt violation of the Oslo Accords and that must be fixed. " Police arrested 13 Israelis who entered Nablus illegally including three who are under restraining orders. They were turned over for questioning. A Palestinian who hurled stones at an IDF force was also arrested. Minister Yishai said, "The visit here is important and I hope the impairments will be corrected. The answer to the Palestinian Authority is to act according to what we believe in." Leaving the compound, the interior minister also addressed the issue of settlement construction. "Building permits are the right answer to the many violations of agreements by the Palestinian Authority but that's not enough," he said. Asked about the issue of women soldiers' singing, he said: "If we want haredim to serve in the army we must find a way to allow them to serve and at the same time maintain their beliefs and way of life." Since the second intifada, Joseph's Tomb has been under Palestinian control. The IDF allows organized groups to visit the site at nights. However, some breslov hassidic groups arrive at the compound without coordinating their visits. The passing year has seen recurring clashes between Israeli worshippers and Palestinians with IDF forces caught in the middle. Last April, 24-year-old Joseph Ben-Livnat was shot to death by Palestinian officers in an incident at the site. 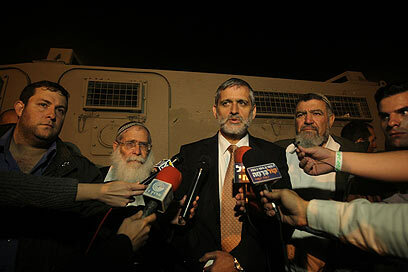 See all talkbacks "Yishai calls for Israeli presence in Joseph's Tomb"